Razer Blade Pro Review: Is it the Best Gaming Laptop of 2017? The Razer Blade Pro is an amazing combination of power and beauty. Top of the line hardware has been fitted into this portable, light weight, thin (0.88 inch chassis) beast to offer premium gaming experience at an affordable price. The Pro has got several models but the one with the price tag of about $3700, lets you game at 4K resolution with the help of Nvidia Geforce GTX 1080 with 8 GB of V-RAM and G-Sync for anti screen tearing! And that's just the beginning when it comes to the Razer Blade Pro! While there is nothing very new about the Razer Blade Pro's design, it's black matte-like aluminium looks quite good on it. It weighs 7.8 pounds and has a dimension of 16.7 x 11 x 0.88 inches - quite surprisingly thin for a gaming laptop, that too considering the power packed in this laptop! While 7.8 pounds may be somewhat difficult to carry, when you compare with some other gaming laptop heavyweights like the Asus ROG GX800, or the MSI GT83VR Titan SLI, it suddenly does not feel that heavy! Its lid has got the green three-headed snake symbol. So, actually, the change here is that the Razer Blade Pro is just bigger than its predecessors and the Razer Blade Stealth, its keyboard and touchpad (more on that later). 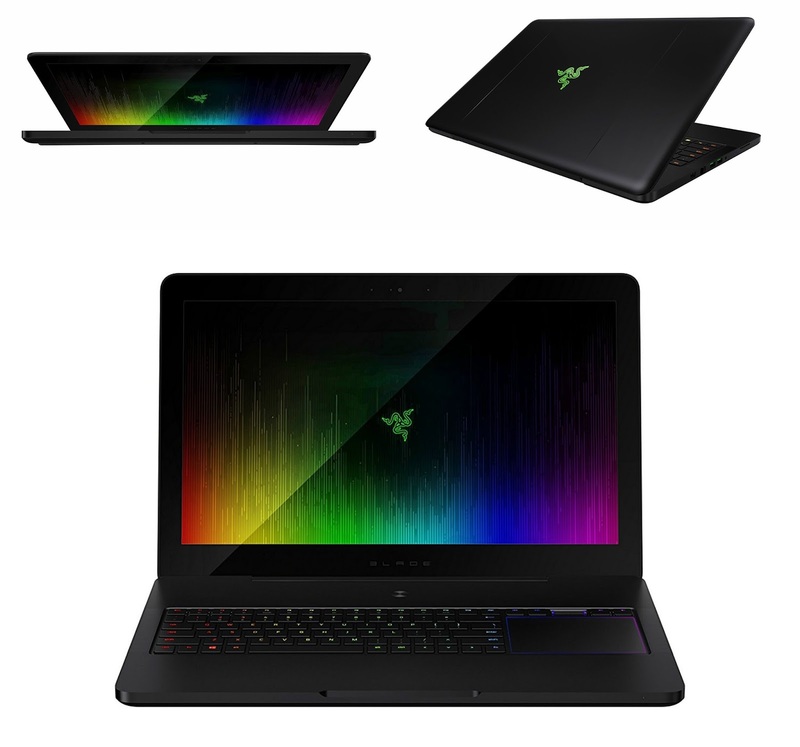 The Razer Blade Pro moves away from the ordinary placing of the keyboard and the trackpad and accommodates the trackpad in the right of the keyboard. The keyboard is quite large, backlit and spacious. The touchpad is located along its right upper portion and is also backlit. This leaves a good amount of space for your palm below the touchpad. A thin speaker set is situated along the sides of the keyboard. The power button rests on the top of the keyboard, and middle of both the sides. There is a USB 3.0 port, USB 3.1 port with thunderbolt 3 support, HDMI 2.0 port, an SDXC card reader and a Kensington Lock Slot on the right of the Razer Blade Pro. On its left, there are two USB 3.0 port, a Gigabit Ethernet port (which sits a little bit awkwardly as it is slightly larger than the sides of the laptop), a 3.5 mm headset jack and a power supply slot. The Razer Blade Pro has got its intake fans placed at its bottom. So, in order to circumvent air, there are two rubber strips, which elevate the laptop a little bit. Razer Blade Pro features Razer's own Chroma keyboard, which is quite gorgeous to be honest. It has been a really welcome change compared to its predecessor's Switchblade keyboard which had minute customisable LED screens. The keys in the Chroma keyboard are seperately backlit, customisable, and can produce upto 16.8 million colors. Due to it being individually backlit, the colors are vivid and bright, therefore quite noticeable even in bright daylight. Razer Blade Pro's keyboard is the world's first ultra-low profile mechanical keyboard which accompanies extremely thin switches. And the result is that the slim chiclet keys functions and sounds just like a mechanical keyboard! However the keyboard has just 0.9 mm of travel space which may feel a little insufficient for some of you. I personally find 1.5 mm of key travel best suited for me. This issue has occurred due to the placement of the trackpad. Also, the placement of the shift key above the right arrow took me quite a long time to adjust to. It requires just 65 grams of force to actuate. The less force required made typing a real breeze. Also, the Razer Blade Pro's keyboard is extremely responsive and registers the presses very fast. This took me a little time to adjust to it but after a while I could again regain my typing speed of 70 words per minute. The keys being both shallow and mechanical cause the typing on the keyboard to be a little loud, perhaps. It was not as bad as the Blackwidow though and you will cease to notice it within a few moments, I am sure! The previous Razer Blade Pro had the Switchblade, which was a touchpad, and also doubled as a capacitive touchscreen. It could also be used to display customised function keys. It could at least have retained its LCD touch panel / second display and Dynamic Adaptive Tactile Keys of the original Blade circa (2012). Anyways the Razer Blade Pro's touchpad is quite fluid, responsive and it is a breeze to perform two finger scrolls and zooming gestures. It has a smooth glass layer and you can click easily. When you click, the cursor does move slightly; though that can't possibly be a bother. The touchpad is one of the best when it comes to a Windows Laptop, though you possibly could expect a little more in MacOS ones. This feature is the first that I have ever come across in any laptop. It is located just above the touchpad. The Razer Blade Pro scroll wheel's default function is to just allow you to change the volume. But you can change/customise the function using Razer's Synapse software. If you press and holding the Fn key you can use the scroll wheel to scroll through pages and documents. The scroll wheel offers an optimum amount of friction resulting in smooth scrolling! 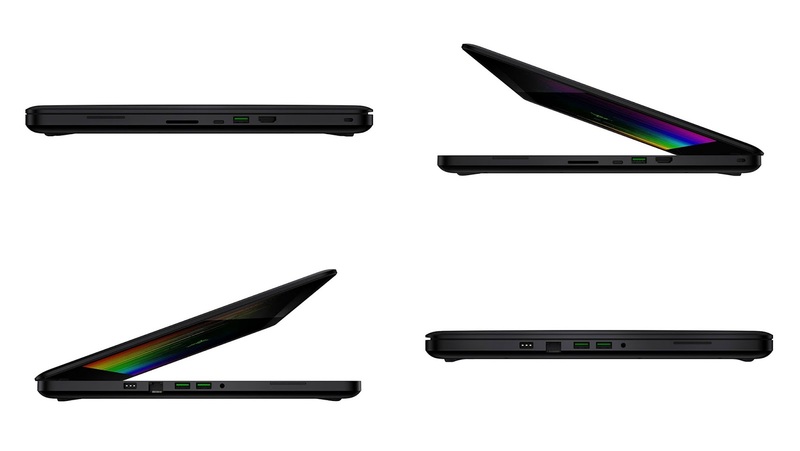 The Razer Blade Pro comes in three models with different configurations. Of them one has QHD display and another has 4K resolution (3840 x 2160 pixels) touch display. However, the immense resolution is not the Pro's only prowess. 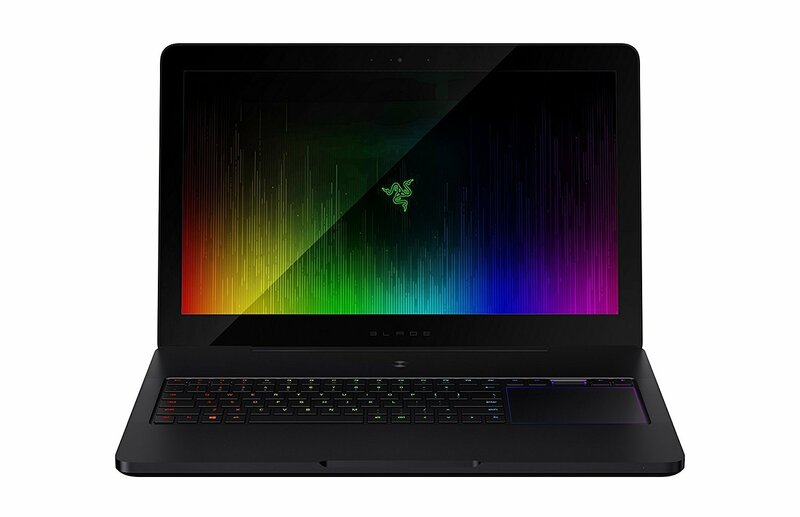 Rather the Razer Blade Pro can produce 185 percent of the sRGB color gamut, resulting in vivid and sharp colors. It also measures a brightness of 374 nits when measured by a X-Rite i1Pro 2 spectrophotometer. The brightness is quite impressive when you compare it with the ASUS G751JY laptop, which has a display brightness of 367.70 nits and the Dell XPS 15 which has a display brightness of 334.40 nits. The MSI GT80 Titan, however has a more brighter display of 394.50 nits. When put in a test for contrast ratio (higher score is better), the Razer Pro achieves a score of 875 which is a little above average. It manages to beat the Lenovo Ideapad Y700, which has a score of 855. The Clevo P870DM2 has the best score however - 1332. In the greyscale test (lower score is better), the Razer Blade Pro achieves a score of 4.52. It is a quite good score and remains above that of the Razer Blade 14 which gets a score of 5.11 and the Clevo P750ZM which scores 5.15. However the Clevo P870DM2 is again a top scorer here with a score of 1.71 and the MSI GT80 Titan follows with a score of 1.82. As for its black measurement which is done using an X-Rite i1Display Pro colorimeter (lower score is better), the Razer Blade Pro rakes up quite a high score of 0.43, which is not appreciable. The Razer Blade Pro gets the best score here - 0.24. The Razer Blade Pro does not use a IPS LCD panel. Even though its black levels are high, its display is by overall a rather impressive one. The color accuracy in the Razer Blade Pro are a little inaccuate (I used the word "little"!) and are slightly tilted towards red. However its display is best suited for gamers. While playing the Quantum Break in this laptop rather than my working laptop, I clearly observed the difference in display. It is rather a treat for your eyes. The hues that it produces are rather remarkable too! Sceneries look quite damn awesome in its 4K display. Heck! just see it for yourself in any YouTube video! Because the Blade Pro is equipped with such an immensely powerful GPU capable of producing immense framerates, it is also bestowed with Nvidia's G-Sync. What the G-Sync is or does is that it synchronises the laptop display's frame-rate with that produced by the GPU. This results in instant display rendering in both Full and windowed modes and thus you won't get any sudden screen tearing or ghosting effect that may occur in laptops/PC without G-Sync. G-Sync actually compels the graphics card to adapt to the screen display frame rates and to prevent the reverse procedure from occuring. The G-Sync however ensures that the Intel HD 530 GPU is always left unused. This won't be a bother at all anyways. 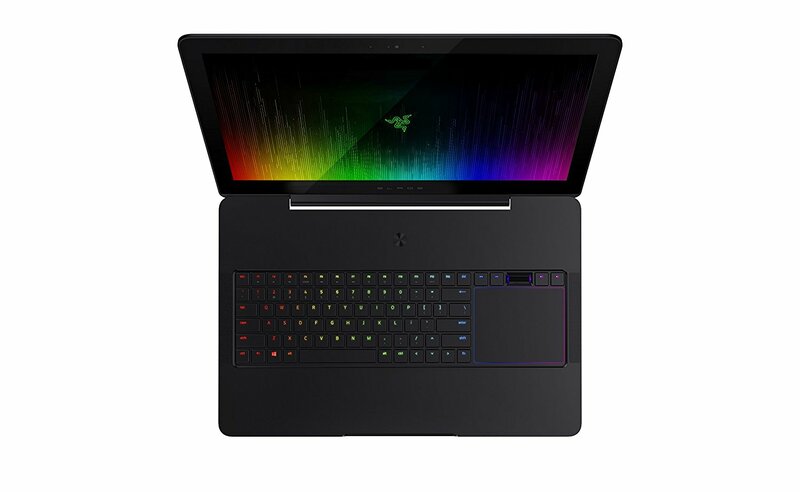 The Razer Blade Pro features 32GB of RAM, an Nvidia GeForce GTX 1080 Graphics card with 8GB of VRAM, a 2.6-GHz Intel Core i7-6700HQ processor resulting in immense power. As for storage, it has made a smart choice as a gaming PC to go full SSD. Depending upon which model of the Razer Blade Pro you buy, there are three different storage options. The one priced at about $3,699 has two 256 GB SSD storage (total of 512 GB); the one at $3999 has two 512 GB SSD storage (1 TB total storage) and the costliest model ($4499) has two 1 TB SSD storage configs resulting in a total of 2 TB storage. All the SSDs are in RAID 0 configuration. That's quite fast and quite big! The top of the line processor and immense and high-quality RAM in the Razer Blade Pro makes sure that you don't ever face any lag while operating the system. Its processor consumes about 45 watt while simultaneously having a base frequency of 2.6 GHz. It can however be boosed to a peak turbo frequency of 3.5GHz. After opening 31 tabs in Google Chrome I ran a full system scan in my Quick Heal Antivirus software. But there was no lag, even while I switched between the tabs repeatedly. With one of Nvidia's best GPUs - the GTX 1080, there is apparently no game that can slow down its performance; come what may! Actually the graphics card is Razer Blade Pro's biggest selling point. With Nvidia's Pascal generation of laptops, it has now come to both the laptop and desktop versions of the GPUs offer almost similar power; of course there is a little difference in their clock speed and thermal constraints and CPU speed but the Razer Blade Pro offers a very good PC-like performance while simultaneously not losing its portable touch. I connected my Oculus Rift with the Razer Blade Pro to check how it plays the game Robo Recall. There was no lag whatsoever and the game was fluid. As for a little older games like "Witcher 3: Wild Hunt - Blood and Wine", GTA 5, the Razer Blade Pro delivered quite an amazing display with vibrant and vivid colors. Of course the display was pretty display in both the QHD and 4K variant! When I played the game Hitman the Blade Pro had a frame rate of 101 frames per second in the benchmark test at 1080 pixels resolution, equal to that of the Eon17-SLX. In comparison to it, the Titan SLI and the X7 v6, fared well at 83 fps and 101 fps respectively. In FHD mode, while playing the Rise of the Tomb Raider, it racked up a solid frame-rate of 65 fps, which is considerably good, noting that the average is 58 fps. The Titan SLI however scores even better - 79 fps. However to get an even better idea of the gaming performance of the Razer Blade Pro, I put it to some more benchmarks. In the 3DMark (2013) Fire Strike test (higher score is better), the Razer Blade Pro scores 13770, which is more than that of the MSI GT80 Titan, which scores 13074. The Clevo P870DM2 edges a complete win with a massive score of 16659. In the 3DMark (2013) Sky Diver test it again scores at the near top with a score of 29510, thus beating the Asus G7502VS and the MSI GT80 Titan (having dual GTX 980M GPUs) which have scores of 26885 and 27163 respectively. The Clevo PD70DM2 again wins easily with a score of 31127, because of its much more powerful desktop CPU. In the Civilisation VI game set at FHD resolution and graphics at Ultra, the Razer Blade Pro achieves a frame rate of 49.7 fps, which is pretty decent, considering this game is a CPU intensive game. But considering the price tag of $3699, a better Intel CPU should have been used. In the Dragon Age: Inquisition game, at FHD resolution and graphics set at Ultra, the Razer Blade Pro secured a frame-rate of 95.60 fps. The Clevo PD70DM2 again won with 115.38 fps frame-rate. However, when gaming at UHD resolution, the magic of the GPU comes into play😉 and the CPU has lesser role then. So, the Razer Blade Pro will diminish its performance gap that it has with laptops having i7 processors with about 4 GHz clock speed. When put in PCMark tests (higher score is better), the Razer Blade Pro rakes up quite a good score of 6754 in PCMark 7 (2013) test. Compared to it, the MSI GT80 Titan and the Dell XPS 15 gets a much lower score of 6114 and 5553. The Clevo P870DM2 however gets a higher score of 8103. In PCMark 8 Creative Test (higher score is better), the Razer Blade Pro gets a score of 7567 which is quite appreciable when you compare the Asus GL502VS' score of 7267 to it. In the Geekbench 3 test, the Razer Blade Pro achieved a score of 13406, which is quite good though it gets beaten by the Eon17-SLX, G701V, X7 v6 and Titan SLI which scored 19,929, 16,120 16,411 and 14,765 respectively. Now, as for file transfers, the Razer Blade Pro absolutely rocks it, though not as per the speed of an SSD! Its set of two 512 GB M.2 PCIe solid-state drives in RAID 0 configuration duplicated files having a size of 5.09 GB in almost 14 seconds. The resultant file transfer speed was 372.28 MBps, which even though an impressive number is quite lesser than the 540 MBps average! Compared to it, the Titan SLI got an amazing score of 727 MBps. The G752VS managed to go even further and its single 256GB M.2 SSD storage managed to hit a superb speed of 848.2 MBps. When I ran the OpenOffice Spreadsheet Macro test, the Blade Pro was able to match 10,000 phone numbers and locations in 2 minutes and 2 seconds, which is a tad slower than the average score of 1 min 47 sec. While the Titan SLI is ahead of this one at 103 sec, the Eon 17-SLX is the complete winner, as it finished the job at just 1 min 35 sec. The Razer Blade Pro has a set of dual-firing stereo speakers which are front faced. They are the visible grilles which sit left of the keyboard and right of the touchpad. They are additionally supplemented by a pair of thin, side-mounted speakers which sit on two slits on the left and right sides of the chassis. The resultant quad stereo speakers can provide a surround sound effect. They also can produce quite a clear and rich audio. A common problem with most previous editions of Razer laptops was that they were not loud enough. However the Blade Pro breaks those barriers and while I don't have a sound measurement device, I played a movie in it and was able to hear the sound from the adjoining room. While gaming, I advise you switch the sound effects to Dolby Audio presets for the best experience. Gunfights result in somewhat booming noises. However when you play any games, the fans start to produce quite a bit of noise and may even distract you from gaming peacefully. For the average Joe, the speakers are just fine but for those who don't want to compromise in anyway whatsoever while gaming, they may find a headphone a good choice! The Razer Blade Pro's CPU and GPU are quite the culprits behind its huge power consumption. Considering airline regulations, the Razer Blade Pro has fit in the largest battery it could - 99 Watt-hour. I ran some tests on the Razer Blade Pro with its display brightness set to a constant of 200 nits in all the tests. While made to constantly surf the web over a WiFi connection, the Razer Blade Pro lasted for 226 minutes. It is quite an appreciable score as it fares better than most other laptops using a GTX 1070 or a GTX 1080 as their graphics card. The Clevo PD70DM2 fares much worse - a total of 182 minutes. Even though the Clevo uses a smaller battery, note that the Blade Pro features a UHD display. In a video playback test, the Razer Blade Pro lasted for 3 hours 53 minutes. Both the Clevo PD70DM2 and the Asus GL502VS lose against it as they rake up a total time of 200 and 196 minutes. Along with the Razer Blade Pro you get a 250 Watt power supply. It is not very thick and you can fit it into your laptop bag with not much of an effort. It is quite heavy though. Because of its large battery size, it takes the power supply unit a total of approximately 228 minutes to recharge it to a full 100% charge from nil. Its Clevo counterpart fares better in this regard as it has a 330 Watt Power Supply and a 82 Watt-hour battery. Still, I would say, that this was a pretty good combination on part of the Razer team, to ensure maximum batter life and ensure that the laptop actually remains portable. The Razer Blade Pro's chassis is entirely made of aluminium. As you all know it a great heat conductor; and can make your laptop so hot that it will make for a perfect substitute of your frying pan! 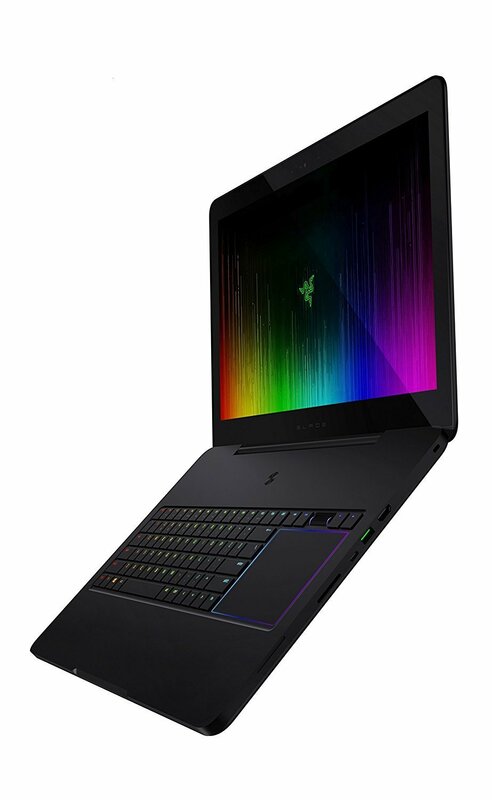 However to combat this negative aspect and to be able to dissipate heat effectively, the Razer Blade Pro has intake fans on the bottom side of the chassis, a hidden internal fan, vapour chamber and dynamic heat exchanger. The Razer Blade Pro's second exhaust at the top of the keyboard helps combat the heat conductivity of its chassis and makes sure the laptop does not heat up much. While playing some games I found that the Razer Blade Pro achieved a highest of 46 degrees Celsius, which felt warm but not at all uncomfortable. I also noted that while the touchpad and the keyboard remain cool, the main temperature rise is at the bottom of the laptop. It comes equipped with a webcam featuring Full HD resolution (1920 x 1080 pixels) video capture. The camera is 2 MP and captures quite vibrant and rich shots and video with sharp detail. It may well be one of the best laptop webcams I came across yet. Razer advertises that its laptops do not feature the usual bloatware that most other Windows laptops come with. It just comes with a software which has just a few apps; that too, to let you better optimize your gaming experience. A notable mention is the Killer Network Manager app which lets you configure your WiFi card, which enables you to get the best performance from your laptop. However its design is quite ugly and aesthetically unappealing. The Razer Blade Pro also features the Nvidia GeForce Experience, which comes with a lot of game related software, including "shadowplay" recording software. The bloatware is kept to a minimum but not completely absent. The Facebook, Royal Revolt 2, Twitter apps as well as the ugly GUI driver layer fall into the bloatware category. Razer Blade Pro: What is the "Synapse"? Razer includes its Synapse software in its Razer Blade Pro gaming laptop. The Synapse app manages the Chroma backlighting of the keyboard and trackpad. It allows you to customise the backlight and also save and create macro shortcuts or even to keep a track of your keystrokes. It also has a gaming mode which disables certain key combination shortcuts as per your wish. You can also use Synapse to customise power management options by controlling whether the fan speed is optimized for lower noise or for efficient cooling at the maximum possible level. The Synapse app had some visible scaling problems and low resolution bitmaps however. Still, its pros far outweigh its cons! Finally, I can conclude that the Razer Blade Pro has its fair share of pros and cons. While there are some laptops with even more powerful CPU than that of the Razer Blade Pro, the Pro however does not offer less than amazing performance in any of the games. And in games that feature UHD resolution, you can be sure that they will be left yards behind by this beast here! Its all SSD storage is really a very clever idea. Though it is slower than other SSDs, still it blazes past a laptop with HDD storage. It also does not compromise on display and graphics and provides quite a bang for the buck. With such power and huge battery life, complemented with such a clever exhaust system and a QHD and 4K display, it is surely worth buying! It is also quite important to note that even with all this power, the Razer Blade Pro does not compromise in portability. It does not weigh much and also is quite thin - perfect to be put in your backpack with little to none discomfort. Should you buy it? I would say Hell Yes! But, if you want to check some other options, you can also check this Comparison of the Top 10 Gaming Laptops of 2017! The Razer Blade Pro has a base price of $3,699 which is the price of its lowest model having Full HD resolution and two 256 GB SSD Hard-Disk. The Rest specs are same. Its QHD model with two 512 GB SSD storage comes at a price of $3,999 and the 4K model which has two 1 TB SSD storage has a price of $4,499. I have however listed the lowest prices of all the models of the laptop available on Amazon. Be sure to check them out and find your best match.